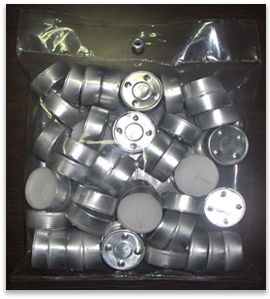 Tea Light Candles are candles enclosed in a thin metal or plastic layer that enables the candle to completely liquefy while lit. They are small and wider than their height and generally burnt in large numbers to compensate for their low light. Tea Light Candles are more in use for their aesthetic beauty than for the light as they are the perfect choice for a lighting up to create a glowing ambience. Scented Tea Lights are often used as Votive candles, while some other Tea Light Candles are often used as food warmers. They also find use in accent lighting and for heating scented oil. 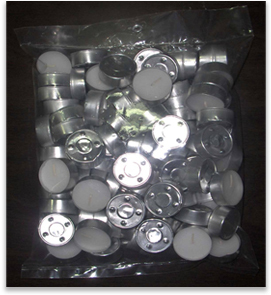 Tea lights can be distinguished from nightlights by the duration of burning as a Tea Light usually burns for 3 to 5 hours but a nightlight burns for a whole night. 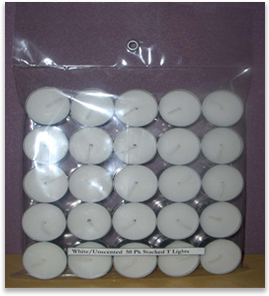 Tea Lights come in a wide range of shapes-sizes and burn times and scents. 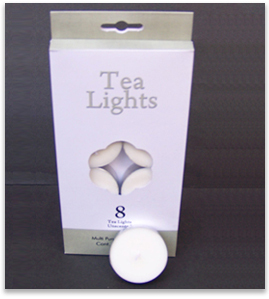 The average common type of Tea Light is circular with a 38mm diameter and 16mm height and with white unscented wax. 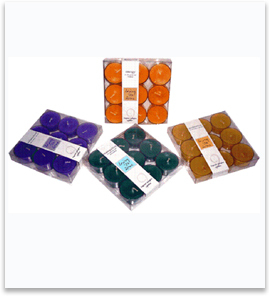 Offering the best in terms of quality and pricing, we are trusted as an Interior Decorating company that offers Wholesale Tea Lights in India. 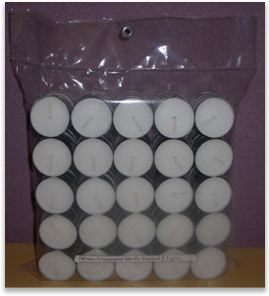 Colored/Scented highly fragranced tea lights in Poly Carbonate Cups packed clear acetate box with product label.